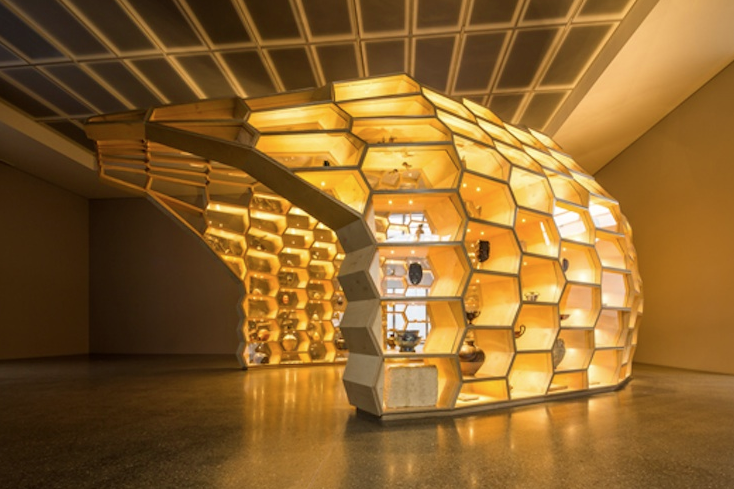 At the invitation of Museum Folkwang, Cuban artist duo Los Carpinteros have created an installation at a central point in the permanent Collection which offers a new place for and a new way of presenting the Archaeology, Global Art and Applied Arts Collection started by Karl Ernst Osthaus. The artistic duo provide an answer as spectacular as it is inspiring. Their Helm/Helmet/Yelmo installation is both sculpture and exhibition architecture, a junction of different possible interpretations that refer to the museum and the means it has for staging content. The museum’s different cultural, political and economic instrumentalisations are skilfully mixed up with historical and current ways of addressing the objects it preserves. Both artists have in their oeuvre combined the elements of museum display (namely architecture, exhibition furnishings and exhibits) in such a way that a venue has arisen where the museum takes the stage in terms of its material qualities, modus operandi, and “institutional character”.